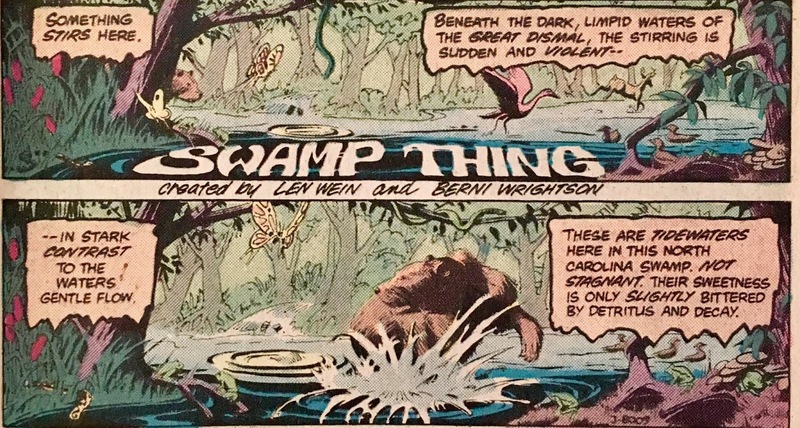 "What Peace There May Be in Silence"
I haven't read much pre-Alan Moore Swamp Thing... so this one's new to me! We open with Swamp Thing rising from the muck. 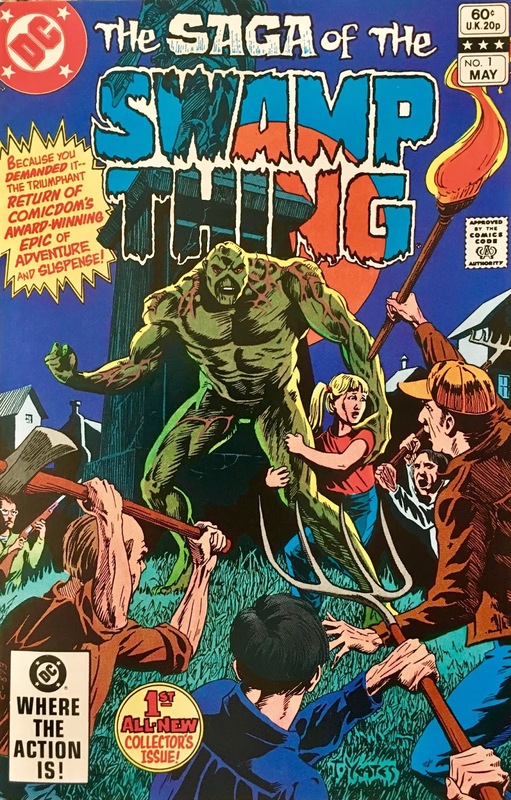 We're immediately told that he was created by Len Wein and Berni Wrightson... which made me wonder if they already knew how special this character would become to folks... then, I noticed that the ad on the inside-front cover is for... the Swamp Thing feature film. Welp. Anyhoo, he rises up, and gives us a look into his secret origin. 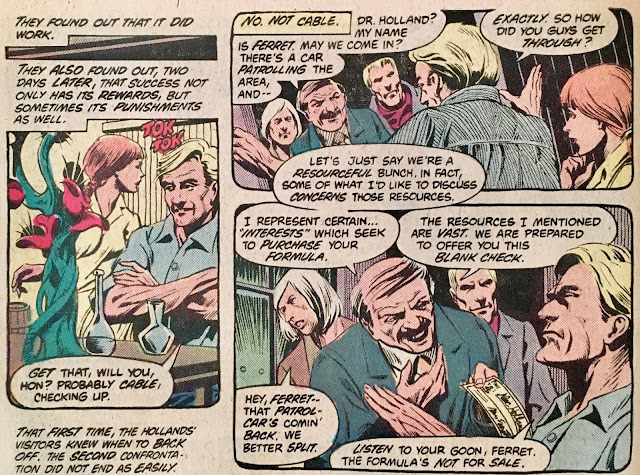 The quick of it is, Alec and Linda Holland moved into a colleague's barnhouse laboratory in Louisiana in order to toil away on a biochemistry project without interruption. Theirs was a sort of growth-accelerator... and wouldn'tcha know it... it worked! It wasn't long before an interested party began paying them visits. 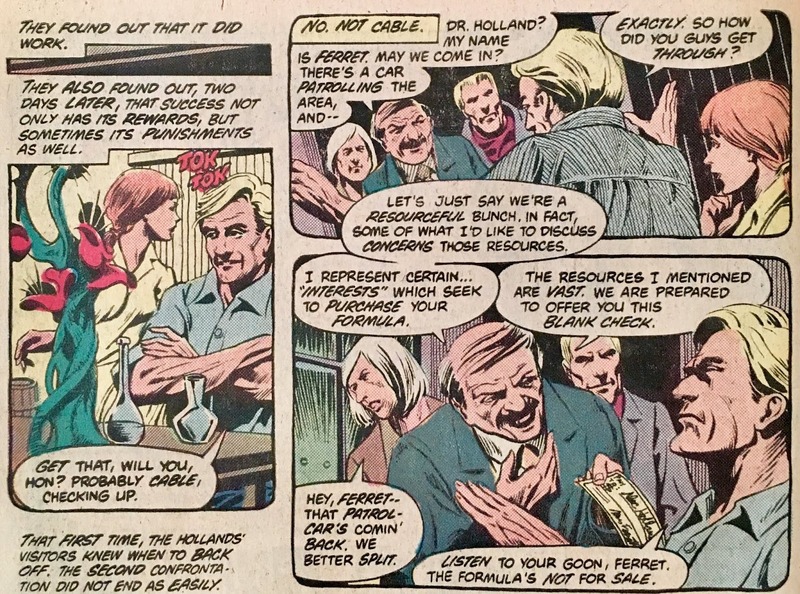 One, a fella named Ferret offered to purchase the formula... however, the Hollands weren't sellin'. The second time Ferret came a'callin', he wasn't as patient. Though in fairness, Alec did answer the door holding a shotgun. Anyhoo, Ferret's goons kayo Alec... and when he wakes up he finds the whole barn had been rigged to blow. 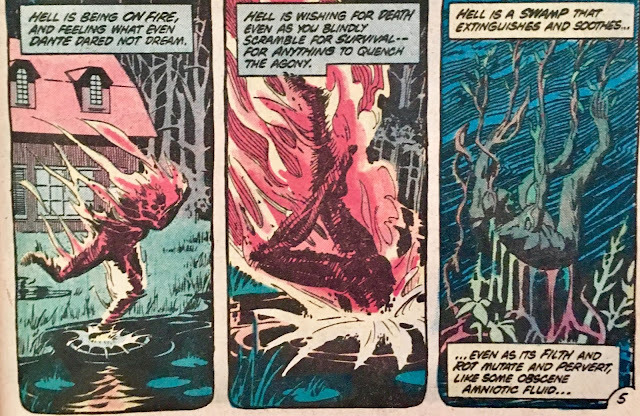 An engulfed Holland rushes out of the inferno... and into the cool murky depths of the swamp. He emerges a changed man (we'll ignore the retcon for now)... more plant than human. That's not the worst of it though, Alec then finds the body of his wife. 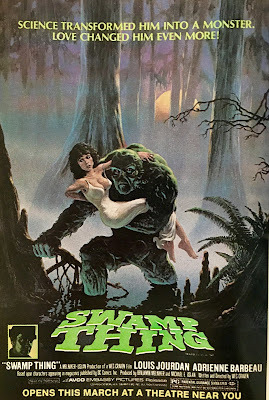 After a quick and dirty recapping of some of the events of Swampy's first volume, we move back into the present. Well, the near present. 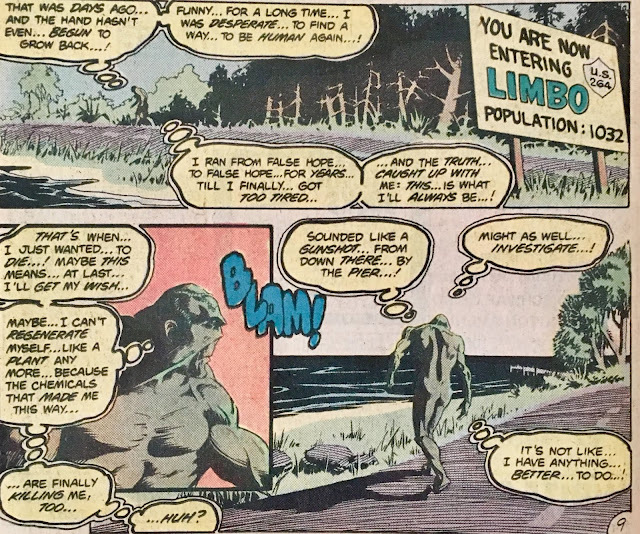 A few days prior, Swamp Thing made his way into the town of Limbo, North Carolina... where he happened across a handful of drunken hunters just as they're about to be mauled by a Mama Bear. Swamp Thing hurls a tree into the fray to enforce a bit of separation... likely more to protect the bear than the hunters. 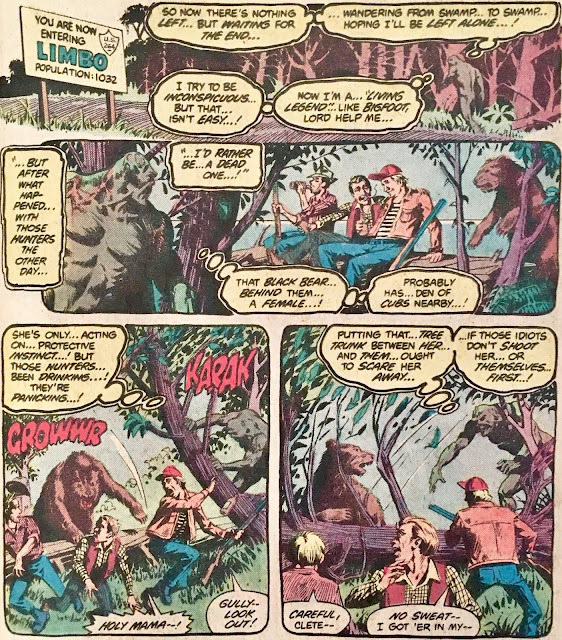 The hunters, naturally, turn their guns on Swamp Thing. One unloads his shotgun into Swampy's chest... which, ya know... isn't terribly effective. 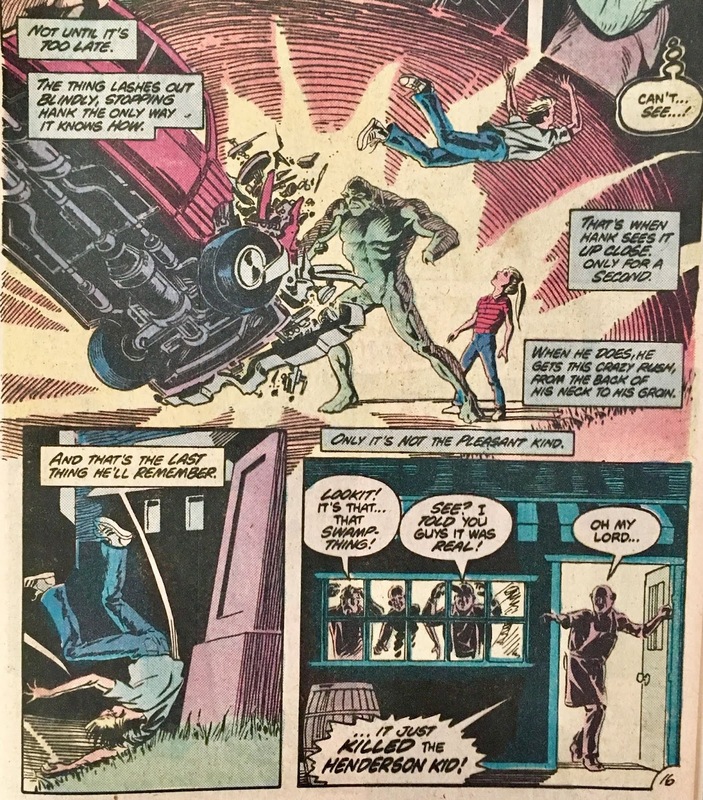 As our hero attempts to regain order, another hunter manages to cut off Swamp Thing's left hand. Swamp Thing dumps the lumps in the bog so they can sleep it off, and continues making his way into Limbo. In the (actual) present, he notes that his hand hasn't yet grown back and wonders if this means it's a no-go on any future regeneration... maybe, this marks the beginning of the end, and his final release from this cursed existence. Well, I don't wanna break the news to him, do you? Inside Limbo proper, we meet a slimy looking fella named Harry Kay checking into the Hotel Parsons. He's holding a small box, which we'll explore the contents of later. 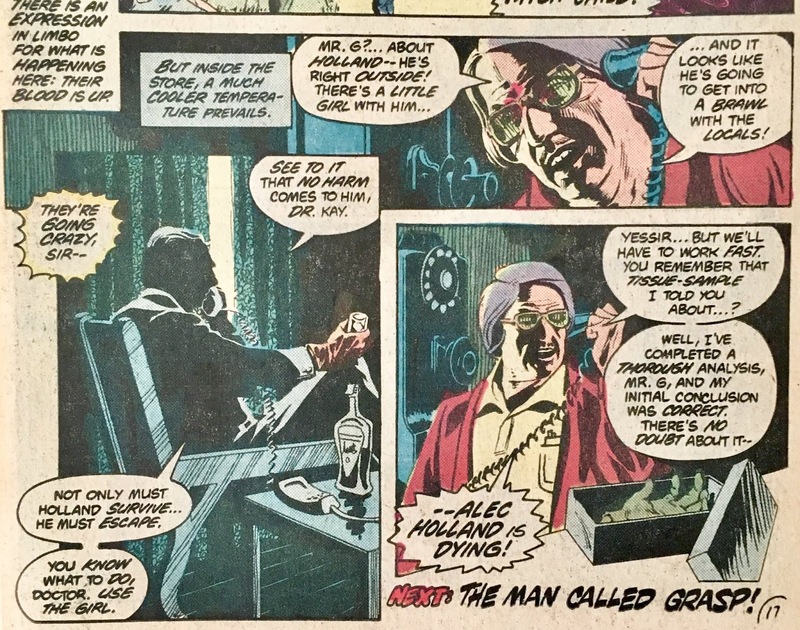 After sassing the girl behind the counter for a bit, he heads over to a pay phone to inform a "Mr. G." that Alec Holland is definitely in the area. 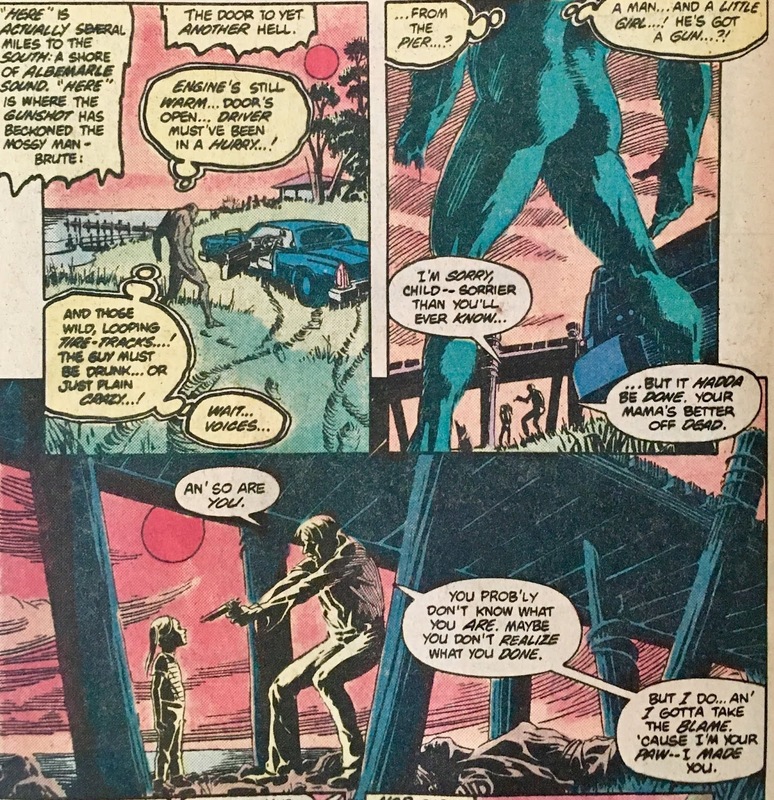 We rejoin Swamp Thing as he notices an erratically parked car near some docks. He heads over to investigate, and finds a man about to shoot a young girl. The man is in a frantic state... even apologetic. He claims that he has no choice but to shoot and kill this young girl... we can assume this is his daughter. Oh, he also "had to" kill his wife/her mother, so there's that. The girl stands silent. Swamp Thing interjects before the man can pull the trigger. Well, on the girl anyway. 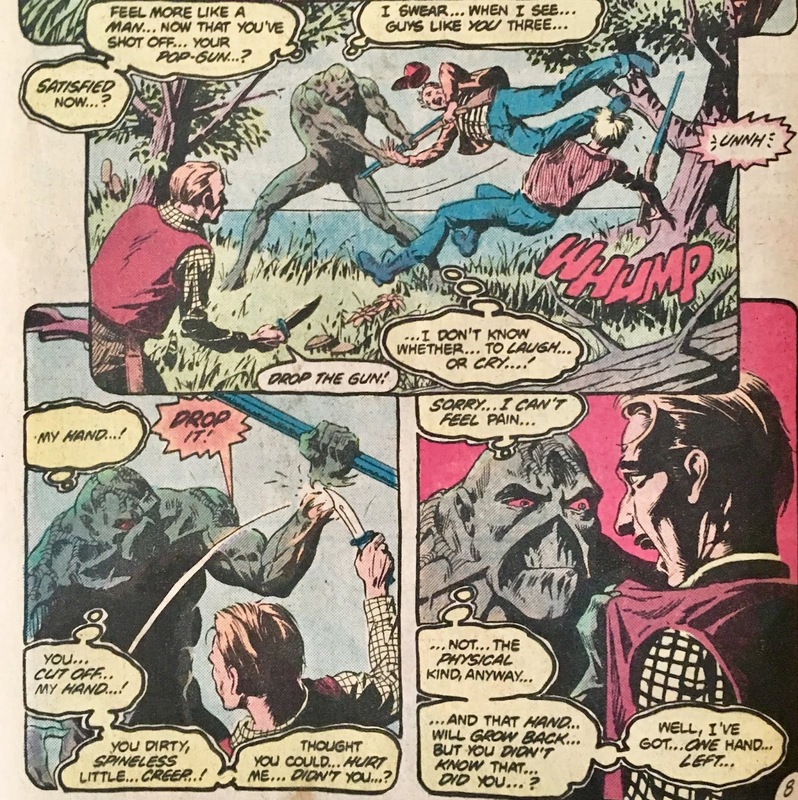 The fella proceeds to unload his pistol into Swamp Thing... which, of course, doesn't work. Swampy grabs the man's hand... at which point, the fella begins to pray. The girl, by the way, is still standing silently. Swamp Thing and the man begin to struggle for control of the pistol... which results in the man shooting himself. The man slumps to the ground, dead. Swamp Thing then looks to the young girl... who still, appears to be unaffected. Swampy struggles to speak... I love the idea that it's an actual struggle for him to "force sound from his misshapen throat"... that's an awesome touch! The girl, however, does not respond. Our hero extends a hand, which she takes... and they leave the docks together. Back in Limbo, some locals (including those hunters from earlier) are tyin' one on and questioning the validity of the claims that there is a "Swamp-Man" lurking outside of town. Heck, the hunters were almost "kilt" by it! 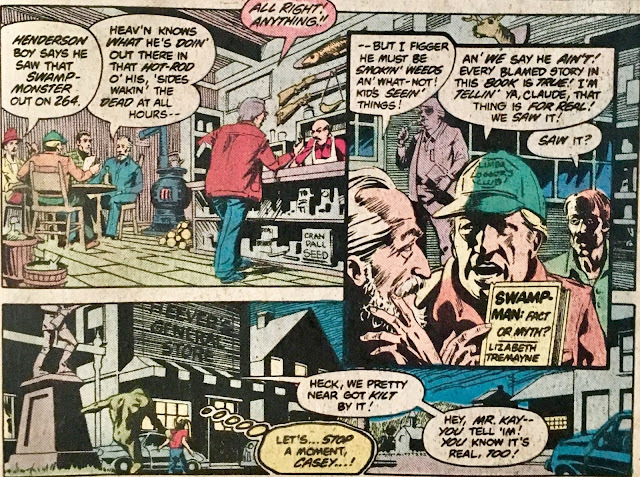 Little do they know, at that very moment, that "Swamp-Man" is right outside the bar! Swamp Thing has brought the young girl (who we now know as "Casey") to the Sheriff's Office. 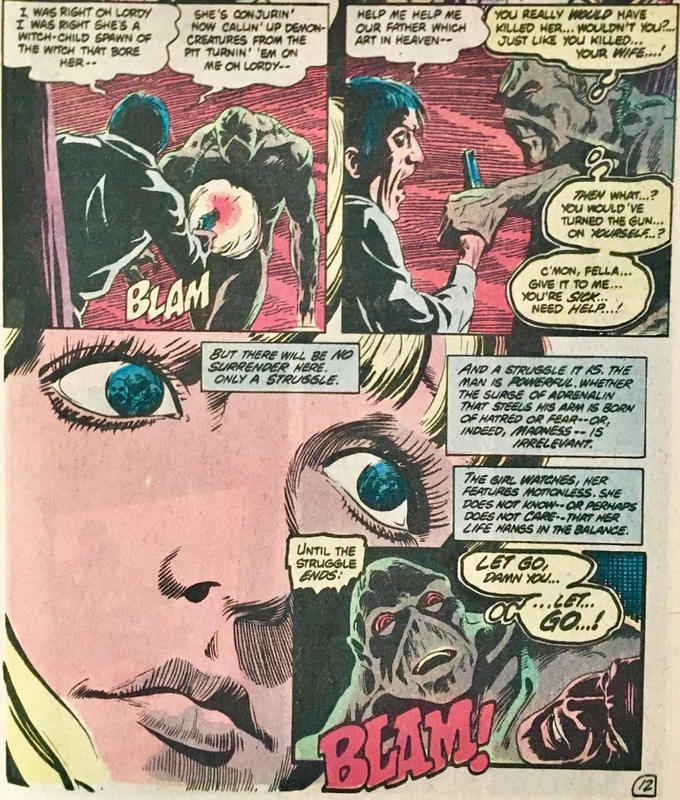 She hasn't yet said a word, however, somehow Swamp Thing feels like they can communicate. Heck, I mean, he "knows" that her name is Casey. Just then, "that blasted" Henderson kid blasts onto the street in his hot-rod. The dumb jerk usually pulls these shenanigans, since most nights the streets of Limbo are empty. On this night, however, there just so happens to be a great big muck-monstrosity in his way. The hot-rod plows right into Swamp Thing... which, is about as effective as a shotgun blast (which is to say, not at all). The impact sends "that blasted" Henderson kid flyin' through the windshield to his demise. 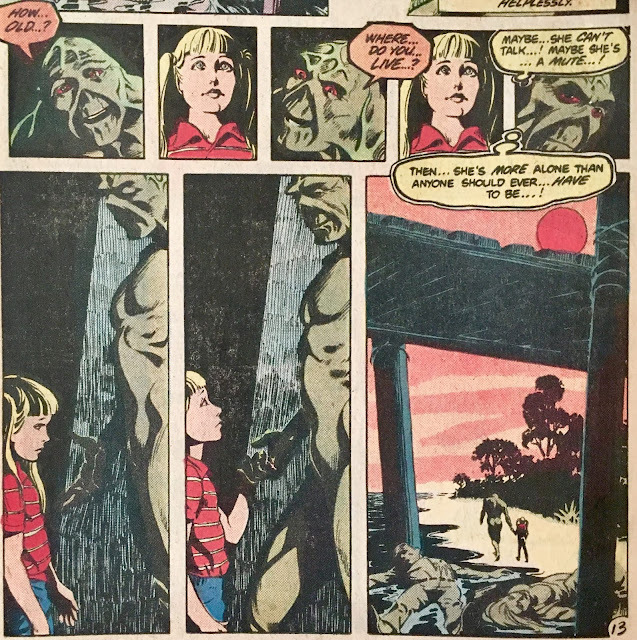 This rouses the locals who, without the benefit of context, assume that Swamp Thing murdered the kid! The locals then go "full yokel" by fetchin' there torches and pitchforks. 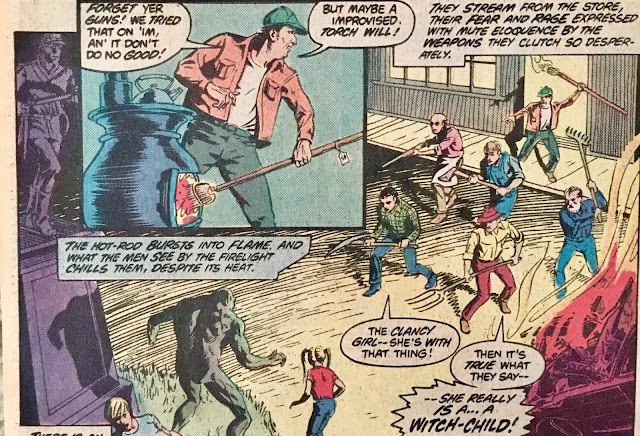 Worth noting, they refer to young Casey as a "witch-child"... which gives us a bit of insight as to why her father was trying to "off" her earlier this day. We wrap up with Harry Kay on the phone with his employer. He informs him that Alec Holland isn't just "in the area", but right outside his window facing off with a gaggle of townies. 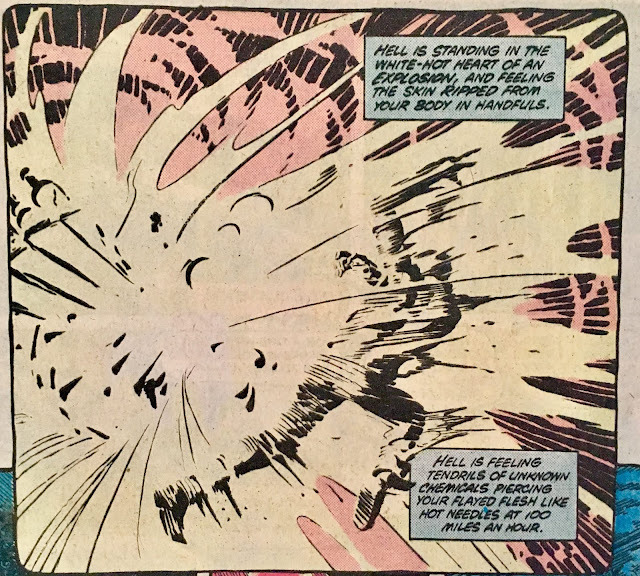 "Mr. G." tells Kay that Holland must survive this encounter... in fact, he must find a way to escape. Our last image features that box Kay was carrying... inside it, Swamp Thing's left hand! Kay deduces from it that... Alec Holland is dying! That's not all, folks... we've got a groan back-up. 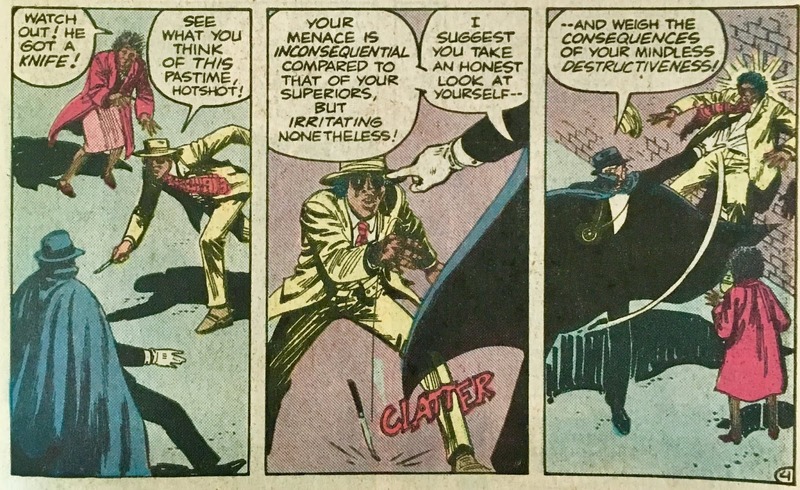 starring the groan Phantom Stranger. C'mon, I was in such a good mood there! Alright, we may as well get to it. We open inside a church where a Reverend David Foster is wrapping up service. This one is about as subtle as a brick to the face, so prepare yourselves. He collects the tithings from his congregation... playing up how these collections are used to help the church. One member of Foster's flock is Mama Balloo, a former practitioner of voodoo. 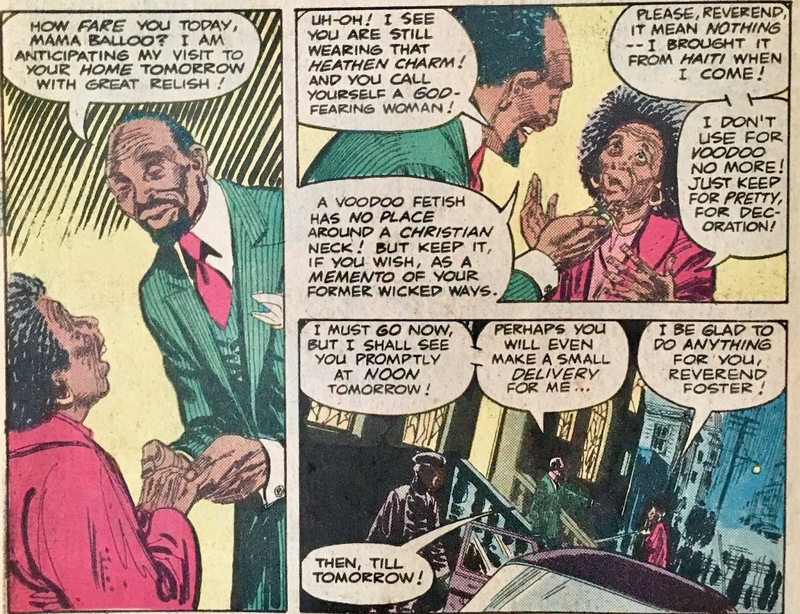 Foster approaches her, and points out that while she still wears a "heathen charm" (a voodoo fetish), he's okay with it... because it can serve as a reminder of her former "wicked ways". He asks if she can do him a favor, and make a delivery for him. She's more than happy to oblige. 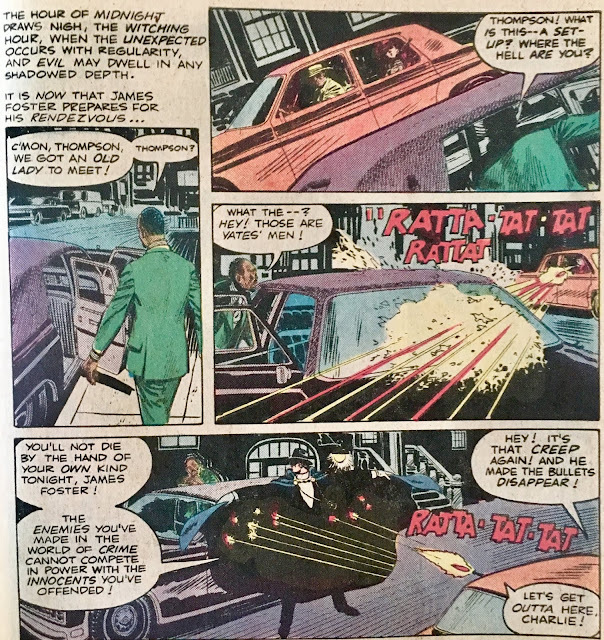 Foster leaves, and is about to hop into his car, when he meets the Phantom Stranger. 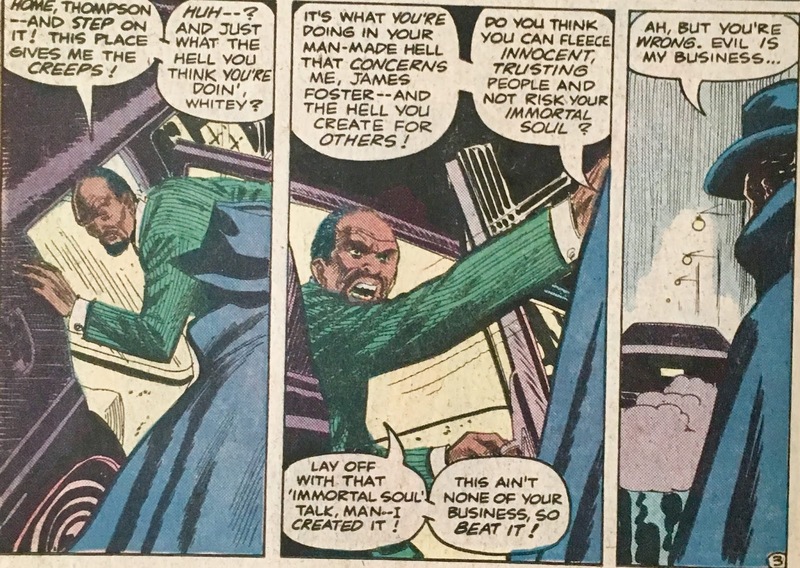 The Stranger accuses him of "fleecing" his flock... and Foster, to his credit, doesn't deny it... he just tells the Stranger to mind his own beeswax. The Stranger does leave... but not because of anything Foster said. Turns out, at that very moment, Mama Balloo is being mugged! The Stranger takes out the baddies with the quickness you'd expect. The next day, Foster visits Mama Balloo with gifts of chocolates... and, of course, that package he wants her to deliver for him. 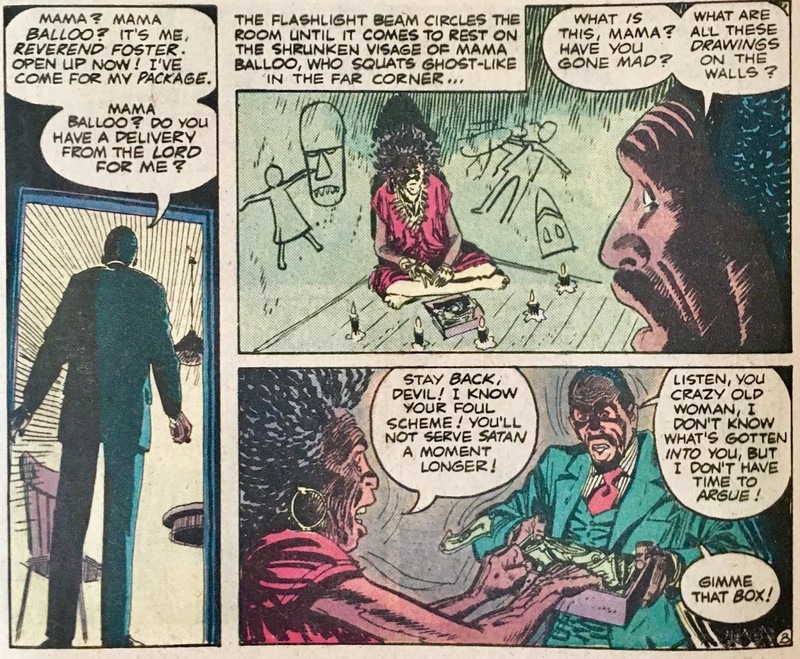 On her way to the drop off, she runs into a young fella named Pele... who is a part of her "old life" in voodoo. Balloo tells Pele she wants nothing to do with him, as she is now a "good Christian lady". Pele tells her what's up... Reverend Foster ain't a good dude. They struggle over the package... and it tears, revealing thousands of dollars worth of heroin! Balloo is ticked. That night, Foster heads over to the rendezvous spot to get paid for the "delivery". Since the delivery never happened, his customers drive by and unload several guns in his direction. Lucky for him, the Phantom Stranger just happened to be in the neighborhood. The Stranger protects Foster from the gunfire... but promises, he's anything but safe. ... which he sees as a box full of roaches! 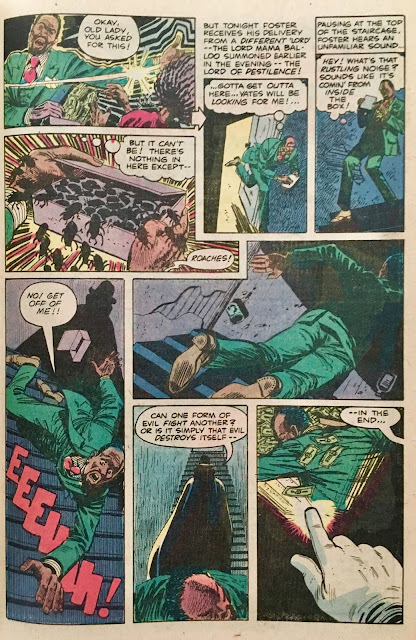 He rushes out of the apartment... and trips down the stairs to his death. What an abrupt ending for Reverend Foster... and this story! Well, I'll be... absolutely loved this (well, the "feature" story anyway). I don't know a whole heckuva lot about this Pasko run. It's not like it's necessarily "derided" or anything, it's just overshadowed by what followed it. After reading this (and keep in mind, this is the only issue of his run that I've read) I feel like that might be a bit unfair. I really enjoyed this. 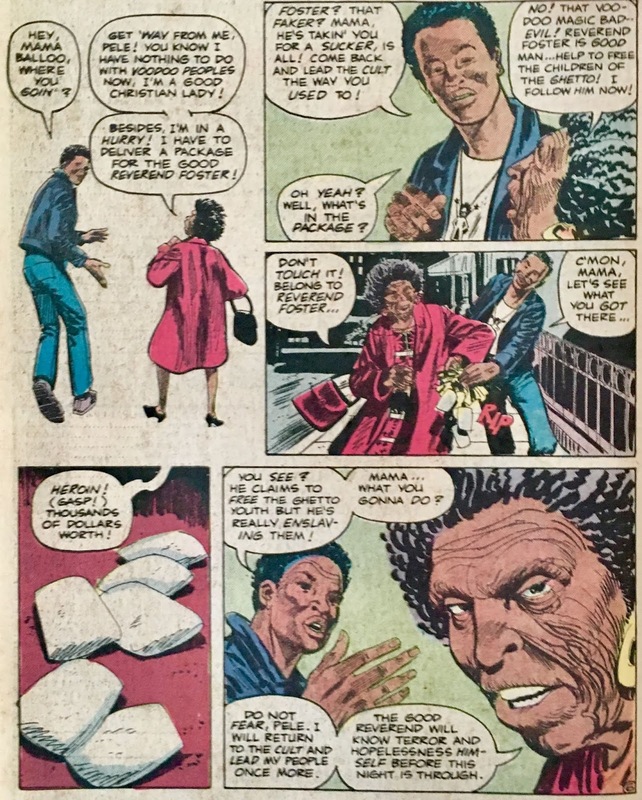 I've been looking a long time for a comic that could actually scare me. Don't get it twisted, this isn't that book... however, it did manage to make me feel uncomfortable. There's definitely something about it that left me ill at ease. Not sure if it was the art or the story itself, but... I dunno... it made me feel a bit "on edge". Though, if I'm being honest, I could've done without going "full Frankenstein" with the torches and pitchforks... but, whattaya gonna do? It's pretty clear from the "witch girl" accusations that Limbo is a superstitious little town... and, I'd wager that they know that pitchforks and torches might work in a pinch. I appreciated the inclusion of a quick 'n dirty recap of the origin and first volume. It didn't overstay its welcome, and got us up to speed so the "present day" story could begin. 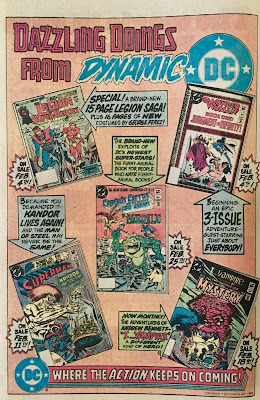 Newcomers would know that this is not "just another" superhero book... or even a "superhero book" at all. 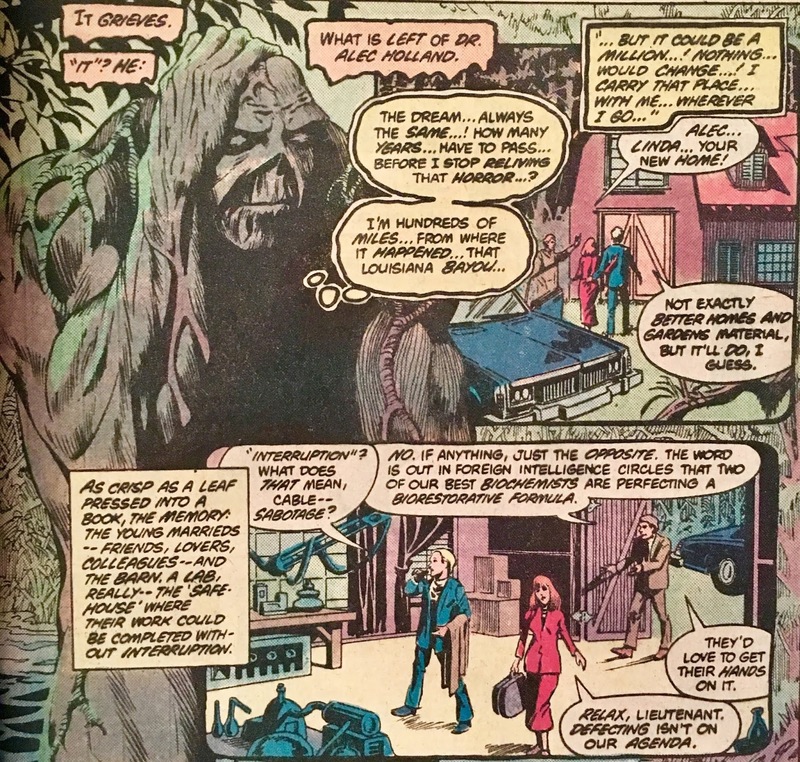 Swamp Thing is a tortured and undying soul... haunted by loss and regret. Excellent stuff. Then... there's the backup. Man, nothing can pull me out of a cliffhanger better than a damn backup. 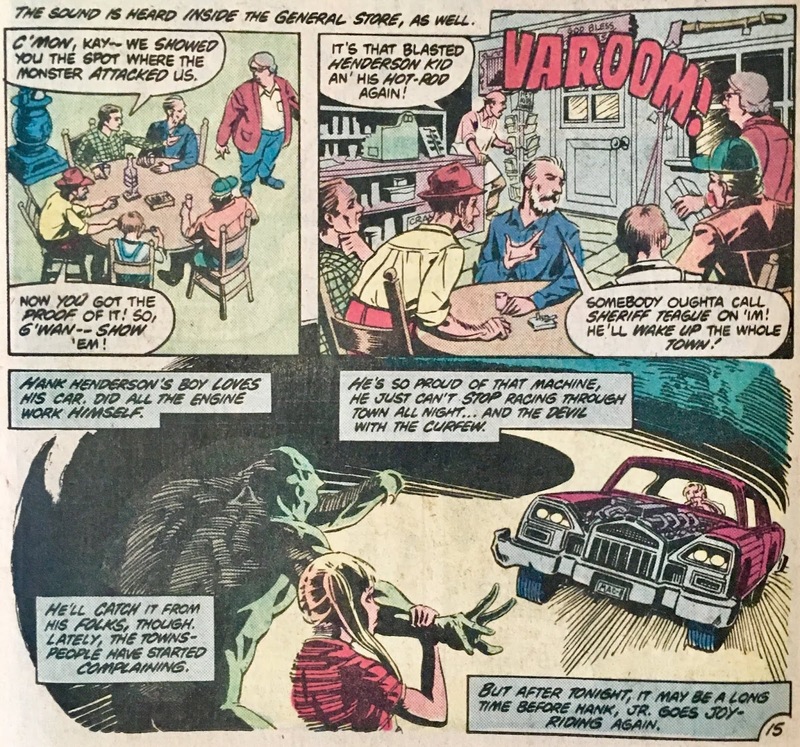 C'mon... this is the first issue of Saga of the Swamp Thing... did we really need a friggin' Phantom Stranger backup?! The backup... was what it was. Heavy-handed and as subtle as a shovel to the face. Great art though... I'll give it that much. I'd say the most interesting thing about the backup was that it depicted a Reverend as a thief and all-around jerk... and yet, this issue still shipped with a Comics Code Authority stamp! Overall... for a pretty great introduction to (pre-retcon) Swamp Thing, I'd certainly recommend checking this out. I had a blast with it. 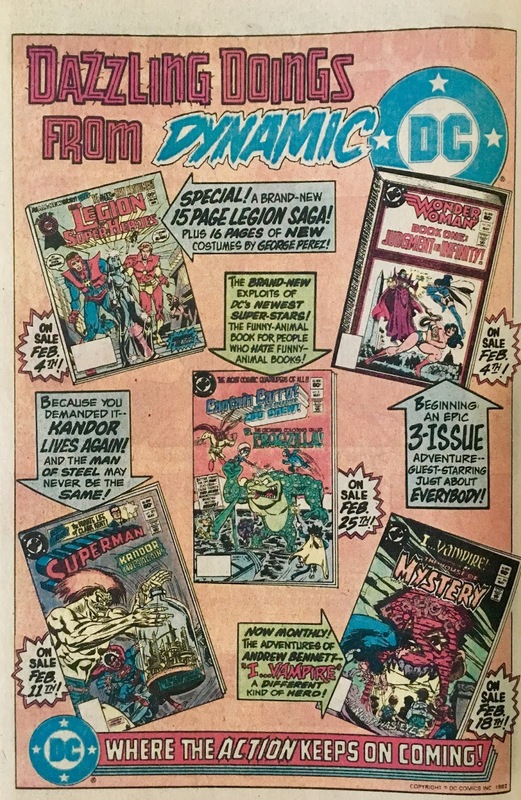 If you're a Phantom Stranger completionist... well, there's something for you here too. For higher-rollers, this issue has been collected in Swamp Thing: The Bronze Age Omnibus and is also available digitally... for a buck! 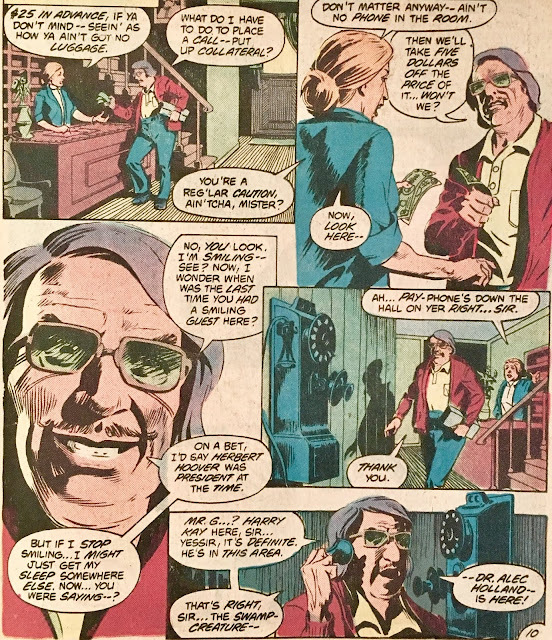 I made a joke about not demanding it on FB, but I bet there were some pretty sincere Swamp Thing fans clamoring for this series to happen...not as long a line as could be queued for Batman, but definitely longer than could be made for the Creeper. Still, it's a definite that the impending movie had everything to do with this volume happening. 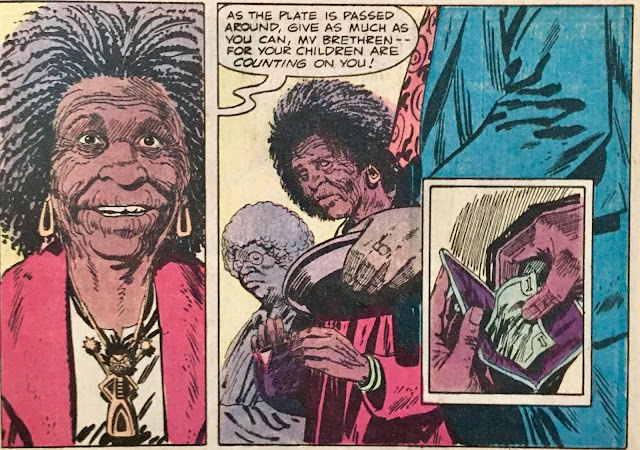 I do have to correct you about Alan Moore's retcon--he didn't discard anything that came before, just made some of it irrelevant when Alec realized he wasn't ever going to be human again. 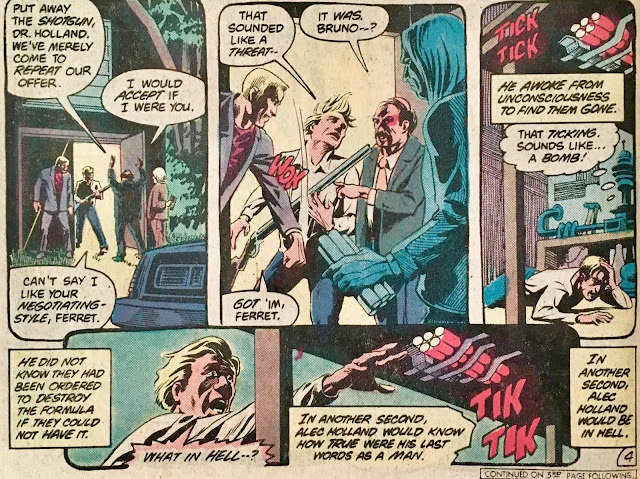 So that impetus, those stakes vanished from the story--and Moore even deals with that in the first two issues after "The Anatomy Lesson." Indeed, you could say that Moore's entire run is about Swamp Thing figuring out why he exists and what his purpose is.